There are many words mentioned when I talk about my future and my career goals. Two of the most used words are “shadow” and “internship” because I am at the point in my life where I am trying to figure it all out. And by “it”, I mean the career that I am planning after I have my degree, of course. I want to be an entertainment journalist more than I want to breath…well maybe that’s an exaggeration but you guys get the point. Ever since I was a little girl I was always intrigued by the lifestyles of the rich and famous. I had just about every book on all of my favorite celebrities and I knew all of their weird facts. I used to pride myself on the fact that I knew Hilary Duff’s dad owned convince stores (I know, I know). But anyway, when you are in college and you are dead set on a major and the career that you want to bloom from that, you have to go take it for a test run to make sure that you are absolutely certain that this is what you want for the rest of your life. Let’s face it, if you wanted to be a teacher and got through all four years of school only to discover that you hated kids, you practically just wasted many years which is okay, but not ideal. You want a career that you love so that you can enjoy the days ahead that will be spent “making that bank roll” as Ludacris would say. So basically I have been working and learning about my career for the past 6 years and I really like it a lot. I’ve gotten to shadow at radio stations, news stations, and i’ve even done some journalism camps. But this experience in particular really wowed me, and honestly I owe it all to proper networking and a little sisterhood. Asking someone to do lunch and getting an invite to shadow at one of the biggest red carpets in New York City is pretty special. I was on a trip to visit my great grandparents when I got the invite and I freaked out because I had nothing to wear. I truly thought I could get away with shorts and t-shirts this time (not) (silly me). My mom and I ran out to the only department store in the area (shoutout to Macy’s). I grabbed a black cocktail dress and then headed for the shoe department. They didn’t really have too much to offer but they did have a table full of a new shipment of Michael Kors strapy heels and I couldn’t resist. So I grabbed a pair of those and felt more at ease because I now had an outfit and it was a very fabulous one indeed. I think Carrie Bradshaw would have approved. I scheduled a blowout at the Dry Bar which I would have just enough time to make right before the event. My family and I piled in the car and started out trek to the big apple. I woke up in a hotel room thinking “ I have to make this whole day count”. I was only going to be in the city for 24 hours, so being on my A game was the plan. We rolled in to the noisy, bright, polluted New York City at around 2pm. That was right in time for me to make my 2:45 pm hair appointment. I jumped out of my parent’s mini van (trés chic) and ran- walked two blocks over to the Dry Bar. 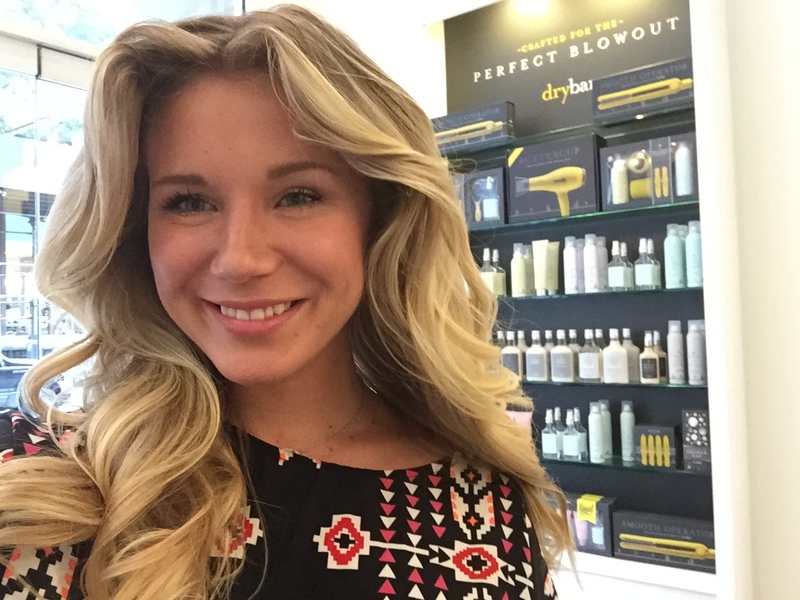 If you don’t know about the Dry Bar, look it up because they are AMAZING. I have ordered their products online and used them at home but I have never been for a blowout before. It was worth every penny, in fact, I probably would have paid more for my blowout because it was that good. After my glam hair was on, I stepped out into the street to hail a cab to get back to the hotel that my family was staying at so I could get dressed quickly and get to the Marriott Marquis in Times Square where the event was being held. I hailed two cabs at the same time. I think it was my glam hair. I picked my driver and hoped in. Fifteen dollars in cab fare later, and I was at my hotel. I took the elevator up to the room number that my mom had texted to me. Except, there was one little problem. I quickly learned that I was in the wrong Hilton. I angrily punched the down button on the elevator because I was already 15 minutes late, hoping that no one was near by to witness my embarrassing mid panic tantrum. I got off the elevator and nearly flew out of that hotel as fast as I could. I ran a couple blocks down, found the right hotel, and went right into the elevator at about 167 mph. As soon as I got into the hotel room, my mom and sisters had laid out my dress and shoes and makeup for me, which I GREATLY appreciated. After everything was on, I added a few dabs of Flower Bomb so I didn’t seem like I was stress -sweating. I charged out of the room, onto the elevator and out of the hotel. Hailing a cab wasn’t an option, so I was relying on Mr. Kors to be enough to get me through. 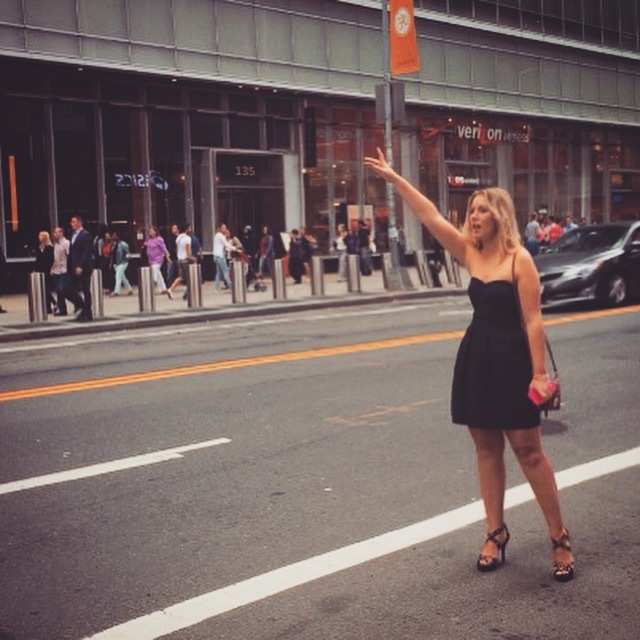 I must have looked silly running though Times Square in heels and a dress but whatever, a New York minute is a New York Minute… and I was reallllllly late. I got to the Marriott Marquis in record time without getting lost. “ I’m here for the press check in,” I said as I entered the lobby. There were lots of hotel guests patting themselves on the back for unknowingly booking a hotel where the Song Writers hall of Fame Gala would be. “Try the 7th floor,” the concierge said. He actually was wrong. Really wrong. But, I took the elevator anyway and headed up to the 7th. The event was on the 7th floor, but not the press check in or red carpet. So back down I went. How do you work at a hotel and not notice when and where a huge red carpet is rolled out? Anyway, I went back down and asked a different person where I should go and he told me to go through the black curtains that seemed to be blocking off the entrance to the red carpet from guests. But instead of keeping out guests, it seemed to have been keeping the press out as well. 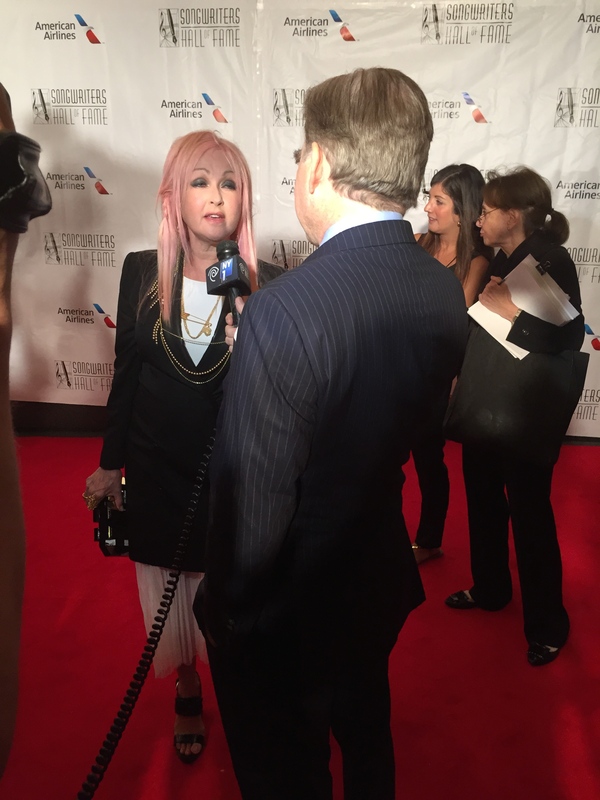 When I got out to the red carpet, lots of people that looked and talked like me were gathered around. Face sheets were being handed out, which were basically pieces of paper with the names and faces of the people that were walking the carpet. I looked for George Whipple, who I would be shadowing that evening and he wasn’t there just yet, which was perfect for me because of how late I had thought I was. I called him and he said that he would be there shortly and he sounded a bit frustrated. Since I looked so awkward standing alone, I started to introduce myself to the other journalists who basically all looked like they knew each other. I was in their crowd. Me. Finally. I met a journalist from aol.com, one from pop crush, and E!. I had to just keep networking, making connections with other people who were the same as me. I was really excited to meet these people who I could potentially be working with down the line. I spotted Victoria, Whipple’s fiancé and the NY 1 camera man, Robin. Just then, my phone rang and it was Whipple who I quickly guided though the lobby so he would arrive on time. He came out, hugged me and got right to the carpet to do his thing. I watched with admiration as he quickly pulled himself together as the first celebs arrived. Being on a red carpet kind of reminded me of being at a zoo. Everyone is there to stare at these celebrities, and if you think about it, it’s quite odd. This was the only time in my life where I could completely stare at another human being without them caring because they are used to it. Carley Rae Jepsen made her way down the carpet and was so sweet and small. She just looked like a normal girl honestly. I tried to imagine what it would be like to be in her shoes. Sub- conscious thoughts like that are where the best interview questions come from. 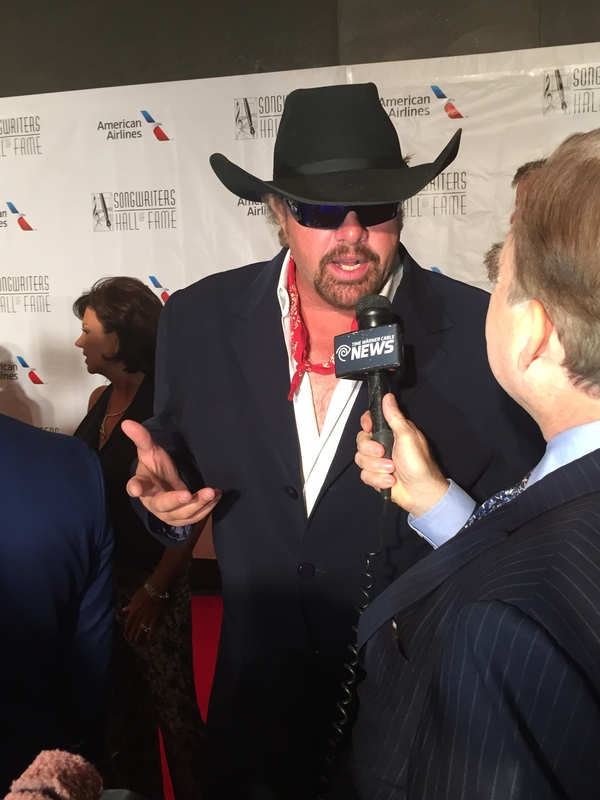 Toby Keith and Cindy Lauper made their way down the carpet. They were really cool and very nice. Pretty much all of the stars stayed and talked for a long time which was awesome and for some reason I didn’t expect. It was like I was hanging out with a whole bunch of people I had grown up with, and felt close too because technically I had. Their music was always there for me when no one else was. Then Lady Gaga pulled up in not a limo, but a Rolls-Royce because it would be unlike Gaga to be ordinary. She graced the red carpet with her presence for a solid two minutes, killing it in just a red coat, heavy black boots and black lingerie. She had several huge body guard men surrounding her so getting a quick glimpse was the only option. She walked by George as he shouted to her, “Gaga, who is your favorite song writer.” Oh well. It was nice while it lasted. 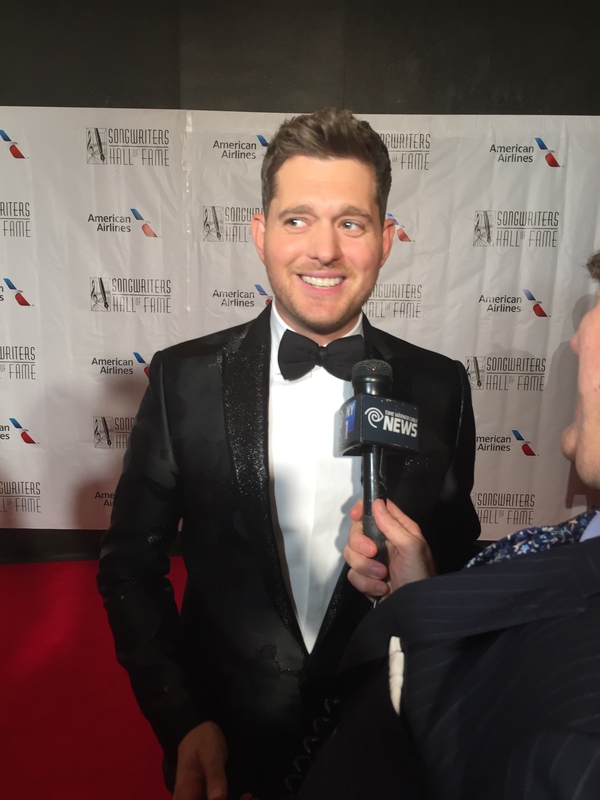 Then Michael Bublé made his way over to us and hung out and talked for a while. He was very handsome, and then some. He wore a black camo suit which I thought was interesting. The red carpet came to an end, which I was really sad about. My family had been standing across the street with the throngs of people the entire time and we were able to meet back up after the red carpet started to clear. Being apart of something so exciting in such a city was such a treat. Not only was I able to take my career for a test drive, but I also got to experience it in a city that I don’t want to ever leave. I felt at home there, and I think it’s safe to say that I have a clear path of where I want my life to go. At the end of the night, I found myself at a closed creperie in Chelsea, with my heels kicked off and a crepe in my hand. New York is too good. I really hope that you enjoyed this post! !